RAP CULTURE, FEMINISM, CRAFT, PATHOLOGY, IDENTITY, FETISH, ABNORMALITY, RACE, SEXUALITY, BEAUTY, and ANATOMY. 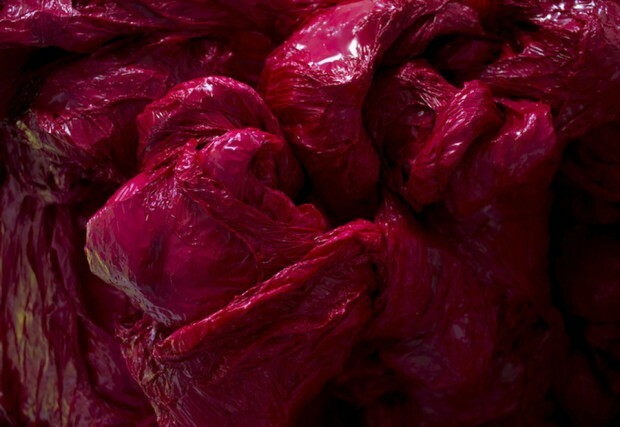 These themes penetrate SHINY / RED / PUMPING, collaging into visual depictions of flesh. Moving and suspended. Through sculpture and video, SHINY / RED / PUMPING reconfigures my perverse observations as a black, Christian, female artist into new, uncanny experiences. The work is raw. The work is twisted. The work is visually combative. Conflating difficult materials into compositions that contest established standards of normativity and desirability, I challenge pervasive social conventions, orchestrating comfortability and uncomfortability within the viewing psyche. Whether in stationary works or live actions, my materials also represent a potential translation between contrasting perspectives that we—the viewer, and myself the creator—can use to communicate. Appealing qualities of light and reflectivity for example, are implied through glass, saliva, mirror, wet specimens, glitter, discharge, and Swarovski crystals. These materials secrete and circulate throughout the exhibition. Born and raised in Philadelphia, artist Doreen Garner exorcises stereotypes of normality and abnormality associated with the body through performance, video and sculpture. She received her BFA in Glass at Tyler School of Art at Temple University in 2009 and her MFA in Glass at the Rhode Island School of Design in 2014. Her awards include the Toby Devan Lewis Award in 2014, The Wood Institute Fellowship Research Grant in 2013, The Presidential Scholarship Award in 2012, and the Creative Research Fellowship Grant in 2010. She’s been an artist in residence at the Wheaton Arts and Cultural Center through the Creative Glass Center of America in 2010, and at the Skowhegan School of Painting and Sculpture in 2014. Currently based in Brooklyn New York, Doreen Garner is participant in LMCC’s 2014–2015 Workspace Residency program.